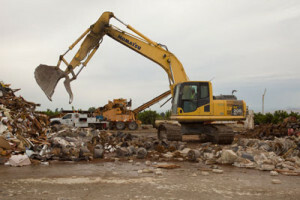 As a designated drop-off location for construction and demolition materials, Peña’s helps customers and commercial businesses keep C&D materials from ending up in landfills. Peña’s offers roll-off bins for recycling C&D debris. For bin sizes and information, click here. Lumber, cement and asphalt brought in by the public, government agencies or via Peña’s routes is sorted and recycled. Cement and asphalt are ground for use as road base. Wood material is ground for cogeneration plants. Green waste is processed and turned into mulch for landscaping. Over 75% of this type of material brought into Peña’s is able to be recycled and kept out of our landfills. Peña’s is the designated recycler of C&D materials for the County of Tulare. For information on how to recycle C&D materials in Tulare County, click here. For more information on where to recycle or what items are recyclable, visit www.calrecycle.ca.gov.